Italy takes plastic—in fact, credit cards are usually the easiest and most-cost effective method of paying for anything while traveling. Yes, Italy takes plastic. Every merchant from the museum gift shops and train ticket machines right on down to the majority (though not all) of the mom-and-pop shops, hotels, B&Bs, and trattorias. Using credit cards is by far the cheapest way to pay for things in Italy—indeed, any foreign country. The exchange rates averge 9% better than even cash withdrawls from an ATM (the second chepeast way to pay for things). You do, however, have to be careful of foreign transaction fees (which can add on 1% to 4%), the chip-and-PIN revolution in Europe that is rending many North American credit cards obsolete, cash advance fees, and remember to take a few minutes to notify the bank of your foriegn travel plans to avoid having your cards frozen while you're on the road. More on each of these issues below. Contrary to the old commercials, you can leave home without American Express (www.americanexpress.com) and never notice the difference. Visa (www.visa.com) and MasterCard (www.mastercard.com) are much more widely accepted in Italy these days, partly because they've partnered with major European cards, and partly because AMEX charges higher fees to the merchants and is slower in paying them, so many small family businesses have stopped accepting it, arguing—with a good point—that nowadays "Everybody has Visa!" Diner's Club (www.dinersclub.com) is accepted in many places (though usually, as expected, only the pricier joints). So is Japan's JCB (which I throw in there in case any Japanese people happen to be reading this.). Discover or any other card will only elicit a raised eyebrow of curiosity and shake of the head from your waiter or merchant; leave any other card at home. You can get much more on financial issues at the excellent financial planning sites BankRate.com (bankrate.com) and Card Hub (cardhub.com) and at this wiki on FlyerGuide.com. While paying with credit cards does get you a better exchange rate than with cash, know that Visa itself imposes a 1% "commission" for foreign purchases/cash advances. Many Visa-issuing banks—recognizing yet another good way to fleece its own customers—tack on additional 1%, 2%, or even 3% "commissions" of their own. They will tell you this is a banking fee for performing the currency exchange. It's all electronic, so there's really nothing to "exchange" in the first place. These extra few percentage points your bank is charging is 100% profit for them, pure and simple, and they are stealing it from you. Luckily, there is a way around this: a low-fee credit card. Your best bet for a friendly, low-fee credit card is a credit union, a small local bank, an online bank, or one of the rare large banks that do not overcharge. Call your card's issuing bank before you travel to let it know that you're taking a trip. If you do not notify the credit card issuing company of intended forign travel in advance, you may find your card frozen when you try to use it abroad. Most banks have a computerized watchdog that monitors your card's use, looking for radical changes in the frequency or location of charges. When it finds suspicious charges, it freezes the account. Ideally, this system alerts them if someone steals your card and goes on a shopping spree, but it has the unfortunate side effect of leaving travelers in the lurch, because on a typical vacation you're (a) charging more than usual and (b) charging it from strange places. The U.S. is woefully behind the rest of the world when it comes to implementing advanced technology in everyday life. Japanese and European cell phones (and networks) are better, many cities now use radio cards for public transport that you just wave at the turnstile while waltzing though (in Hong Kong, you can use your Metro card to buy snacks at 7-11), and many countries are now using more advanced credit cards called "chip and PIN" with computer chips built in (rather than just the magnetic stripe; note, this is different from the radio chip in an AMEX Blue card). Why do I risk the wrath of my more zealously patriotic fellow citizens by pointing all this out? To all of them, your old-school Visa with the magnetic strip is just a worthless slab of plastic. It simply will not work. Best I can figure, the chipcard-only phenomenon started in Scandinavia, but it's spreading. In the fall of 2010, I was actually turned away from a shop in Leipzig, Germany; their store policy —printed right by the register—was "smartcards only." In fall, 2011, I was unable to rent a bike in Dublin from the cheap public stands because they only accepted chip-and-PIN cards. A month later, I found I could not use the automated gas pumps in New Zealand. Get a Travelex Cash Passport, currently the ONLY chip-and-pin card available to the general American market. It's a pre-paid card, so you have to fill it up with cash before you leave—and the exchange rate is an abysmal 14%–15% worse than with credit cards—but it can come in darn useful (www.us.travelex.com). Also: pester your bank—repeatedly—to get with the program. As of 2012, a few American banks are starting to experiment with chip cards (Citi, Chase, and U.S. Bank all now offer some card with a chip, though usually they are all annual fee cards). Unfortunately, in the true, backwards fashion we've come to expect from our banks, most are issuing only baby-step chip-and-signature cards. These have a chip, and so will be recognized by the machines, but no PIN. For purchases of less than $50, this is usually not a problem, as no PIN is required on those. For larger purchases, your larval-stage chip-and0signature card will cause most card readers manned by an actual person (such as at a store or restaurant) to spit out a receipt for you to sign, so again, no problem. For charges greater than $50 at an automated machine, well, there you may run into problems as you will need a PIN. (Note: some banks will issue a PIN with your chip-and-signature card, but this is to access the cash advance feature, which means any purchases made using it will be charged interest at the highest possible rate—usually 21%—and start accrusing immediately, not at the end of a monthly cycle in which you do not fully pay off the card, as with most purchases). Wells Fargo and JPMorgan Chase have each made limited numbers of what they call E.M.V. cards available to select customers. They have a chip and PIN, and they will work abroad. 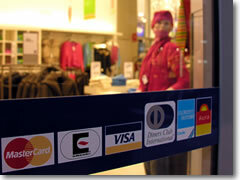 Keep apprised of news on this subject at www.creditcards.com and the forums at FlyerTalk.com. Some credit cards are now charging exorbitant "transaction fees"—plus a laughably inflated APR, which starts accruing immediately—for each cash advance through a credit card, so read the fine print carefully when choosing which Visa card to use on the road. Use cash advances only in emergencies. These credit card folks are counting on your complacency to keep milking you for money. Don't give them the satisfaction. Whenever you get a cash advance on a credit card, the bank starts charging you interest immediately , not after the end of the billing cycle's month as they do with purchases. That means if you take out $200 on the first day of a two-week trip, for two weeks the credit card issuer will be charging you the highest possible interest rate (not that introductory 9.67%, but the industry ceiling of 18% or more), compounded daily, and will continue to do so until you pay your entire credit card bill all the way down. They often also tack on a one-time "service fee" of $5 or more as well. You may be able to avoid all this, however, by being a bit sneaky: They can only charge you interest if you're carrying a balance. The trick is to make sure you never carry a balance on the card by overpaying your bill (by however much you expect to withdraw in cash advances, plus purchases) the month before you leave. It's silly, but it usually works.